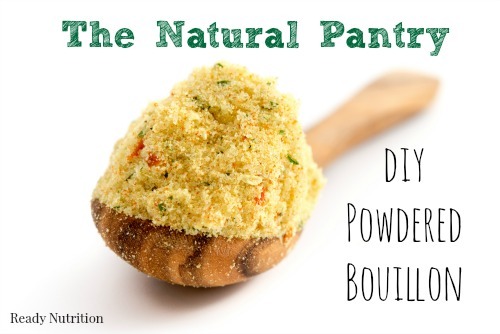 I prefer a chemical-free bouillon powder to use in my recipes and it’s super easy to make. An added benefit to dehydrating your own bouillon is the dehydration process minimally affects the nutritional content of food. In fact, when using an in-home dehydration unit, 3-5% of the nutritional content is lost compared to the canning method which losses 60-80% of the nutritional content. Therefore, the end result is a more nutrient-dense food that can be stored long term. Because it lasts up to 1 year if properly stored, consider making homemade bouillon for emergency meals or for homemade MRES. Making bouillon is quite simple and can be made from beef, chicken or fish bones, or just from vegetables. Essentially, you make your broth as you normally would and allow the broth to chill. Then, remove the fat and boil down the broth again until it has thickened and add any spices to season. Finally, add the thickened broth to your food dehydrator and voila! Yes, it’s that simple. 1 tablespoon thyme, poultry seasoning, parsley, etc. Make your stock and cook as normal (here is the recipes I use for beef and chicken). When the stock is finished cooking, remove vegetables, bones and any fat. Allow broth to cool overnight in a refrigerator. After the broth has had time to chill, skim the fat off the top layer that may have settled during the cooling process. Over medium heat, begin cooking broth again and reducing it by half or until it begins to thicken. Hint: When broth has thickened, it should have the consistency of thinned gravy. Dehydrate on high or 160 degrees F for 12-15 hours, or until completely dry. Grind dried bouillon with a spice grinder and store in closed container or jar. Add your bouillon to add flavor to soups, dishes or add to hot water for a nice cup of nutrient-filled broth. As well, here is one of my favorite homemade seasonings using bouillon that I added in The Prepper’s Cookbook. You use freshly dehydrated bouillon and add it to dehydrated vegetables and make a wonderful all-purpose seasoning mix. It’s extremely versatile and can add more flavor to watered-down soups. In a saucepan over high heat, add diced potatoes and carrots in enough water to cover them. Cook for 5 minutes until soft. Drain. Combine all the ingredients except the bouillon in a blender or food processor and whirl until fully processed. Place on a jelly roll tray in food dehydrator at a setting of 135-145 degrees for 5 hours or until dried and crumbly. Once the mixture is thoroughly dried, add bouillon granules to taste. Store in a jar for up to 1 year. I do the same boil down but put the liquid broth in ice cube trays then freeze. pop a cube out add it to a cup of water and you have a nice broth. Put a couple in a pan with some water and flour and you have gravy. 1) how long does this keep and can it go in dry storage or does it have to be in the fridge/freezer? 2) When you say jelly roll plate, do you mean just a cookie sheet with edges?